A couple of weeks ago, the lovely Bridestock Bride tweeted me during the Great British Bake Off to ask if I'd ever made pastries properly. The answer is a most resounding no. 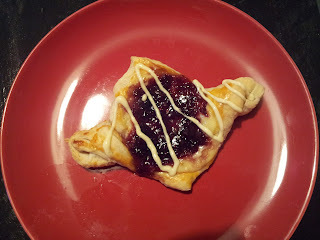 When it comes to pastry, I'm pretty rubbish unless it comes out of a packet - which is one of the reasons why I'm holding off on my GBBO application despite all the badgering. For some reason, I just don't quite have the knack. I can make a good enough pastry for my signature bakewell tart (okay I nicked the recipe off of the mothership and improved it) or a quiche, but because year after year, I fail with my mince pies, I've never quite gotten into the whole pastry baking thing. But it's something I'd love to master over this year. Having consigned most of the defrosted, warmed up contents of my old fridge freezer to the bin - Currys didn't arrive til mid afternoon - I was left with a quarter of a block of puff pastry, the scrapings of a jar of cherry jam, a lemon, some eggs and a couple of mini tubs of Philly. Just right for having a go at some cherry Danish. What surprised me in all the recipes that I read was that the filling was made using cream cheese. I'd always assumed that Danish were filled with a thick, creme patissiere but maybe not. I'm happy to be proved wrong. Even the lovely Mary-Anne from GBBO filled her raspberry and rosewater Danishes with the cream cheese mixture so it must be true. They look a bit rough and ready as I was a little short on pastry and a little over-exuberant with the jam, but are now cooling down ready for breakfast. That's not cheating - I did the recipe today, just not the eating. Onee point of note for the future. Use full fat cheese as the low fat Philly started to split and as per the advice I read on one blog, chill the cheese mixture overnight to stop it from running so much in the oven. Yet again, the phone is flat. Picture to follow tomorrow when I've drizzled them with white chocolate. Need to work on the elegance! Update: Well the pastries did taste better than they look. I think I skimped a bit on the pastry because I only had a tiny bit leftover and next time I will definitely make my own. Wasn't convinced about the lemon-cheese filling. It tasted fab but overpowered the jam - which is an achievement as the cherry jam I use has a really strong, sharp, distinctive taste that comes through well even when used in tiny amounts. So I thought I'd look up in my Mary Berry's complete cook book to see how she does it. And rather disappointingly, she uses white almond paste to fill all of hers - even the classic apricot ones. But I swear the ones I've had in the past from various locations have a different filling. More research needed. Mix the cheese, sugar, egg yolk, flour and lemon zest together and chill overnight. Roll out the pastry to approx 5mm thick and cut into eight squares. Fold each square lightly in half on the diagonal. Make a cut about 1cm running parallel with each of the diagonal edges, stopping about 1cm from the point. Unfold the squares. Fold one of the edges across to meet the point on the inner square. Repeat with the other edge. This forms a diamond shape. Place a spoonful of cream cheese into the centre of the pastry. Top with a spoonful of cherry jam. If you wish, glaze the edges with milk or egg yolk. Bake for 15-20 mins until golden.